Since the global crisis, unemployment in Spain has soared to 20%, double the EU average. This column compares Spanish unemployment with that of France and argues that differences in employment protection legislation account for nearly half of the dramatic rise in unemployment in Spain. Its findings add further support to calls for a single labour contract in the country. The Great Recession stands out among previous recessions for its depth and scale, yet for Spain’s unemployment, the story has an eerily familiar feel. To follow Spain’s unemployment is to go on a “wild ride” (Blanchard et al. 1995, Bentolila and Jimeno 2006). Compare Spain with France; both share similar labour market institutions (employment protection legislation, unemployment benefits, wage bargaining, etc.) and exhibited almost identical unemployment rates, around 8%, just before the crisis. But while the French unemployment rate has only risen to 10% during the slump, Spanish unemployment has surged to 20% (Figure 1). France and Spain are among those European economies which most directly promoted temporary contracts in the past in order to achieve flexibility at the margin. 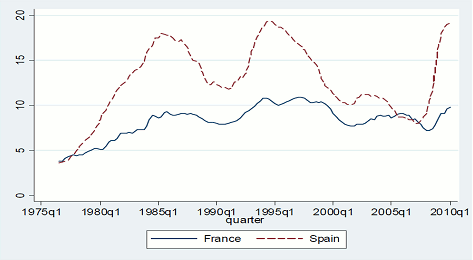 However, temporary employment is much more important in Spain than in France. In Spain, historically, 33% of all employees are temporary, falling to 25.6% nowadays following the destruction of 1.44 million temporary jobs since autumn 2007. France meanwhile has only 15% temporary workers..
With this in mind, in recent research (Bentolila et al. 2010) we ask how much this difference in the portion of temporary workers can explain the different levels of unemployment during the Great Recession, once other potential determinants are considered – like the much higher weight of the construction industry sector in Spain. Why are France and Spain so different? a much laxer regulation on the use of temporary contracts. We find that the combination of these two differences, labelled as the “EPL gap” in what follows, could explain a sizeable fraction (45%) of the much higher rise of Spanish unemployment. To explore this issue, we develop a model in which firms may hire under both permanent and temporary contracts.1 The latter can be transformed into permanent contracts at their expiration, the rest being terminated at little or no cost at all. By contrast, dismissal of permanent workers entails high severance pay and takes time due to advance notice periods and the settlement of legal disputes. It is now well understood that facilitating the creation of temporary jobs leads to an ambiguous effect on unemployment since it increases both job creation and job destruction. However, one novel result that we highlight in our work is that, if the EPL gap is high enough, the increase in job destruction will dominate. The insight is that the higher this gap, the lower the proportion of temporary jobs that are transformed into permanent jobs, because the much larger firing costs for the latter induce employers to use temporary jobs in sequence, especially if restrictions on their use are mild, rather than converting them into long-term contracts. As a result, a higher EPL gap is likely to raise unemployment during downturns. This is precisely the case of Spain, a country which inherited rigid provisions from the industrial relations prevailing under Franco’s dictatorship, when jobs were highly protected in exchange for low wages and the absence of free collective bargaining. While the last two features disappeared upon the arrival of democracy in the late 1970s, the first one remained unchanged until 1984, when the use of temporary contracts with very low dismissal costs was extended to the hiring of employees performing regular activities. According to the widely used OECD (2004) index of the strictness of EPL, which ranges from 0 to 6, the overall EPL score is 3.0 for France and 3.1 for Spain (where the US has the lowest value, 0.7, and Portugal and Turkey the highest, 4.3). Hence, Spain appears only slightly more regulated than France. However, there are good reasons to think that this average EPL index, based on legal regulations and not on their implementation, does not capture Spanish EPL satisfactorily. Indeed, de facto EPL of temporary jobs is much weaker in Spain than in France, whereas the opposite holds for EPL of permanent jobs. Considering only red-tape firing costs generated by third agents, such as labour courts and labour authorities, which cannot be compensated for in wage bargaining (since they are not a transfer from the firm to the worker), we find that the gap between both types of contracts is 50% higher gap in Spain than in France. Further, the use of temporary contracts is rather more limited in France than in Spain. In both countries they can only be used in specific cases (e.g., for temporary replacement, seasonal activities, training, etc.) and they may last up to 24 months. There are however, much fewer de facto restrictions in Spain; for instance, uncertain-completion jobs (e.g., in the construction industry) could lawfully last for an indeterminate period (until the June 2010 labour market reform). Another dimension in which these two economies differed before the Great Recession was the much stronger Spanish dependence on the construction industry since the late 1990s (11.9% of GDP and 13.3% of employment in 2007, against 6.3% and 6.9% in France). We claim that this industrial specialisation in Spain is closely related to its strong dual labour market. In effect, as a result of Spain's higher inflation, real interest rates fell by 6 percentage points when the euro was introduced, against 1.5 percentage points in France. This fuelled a strong investment boom in the Spanish construction industry for at least two reasons. First, the very rigid permanent contracts in Spain would have been inadequate to specialise in more innovative industries, since higher labour flexibility is required to accommodate their larger risks (Saint-Paul 1997). Second, there was a large increase in the relative endowment of unskilled labour in Spain over that period. The higher availability of low-skilled jobs through very flexible contracts fostered a very high dropout rate from compulsory education (from 18% in 1987 to 32% in 1997) and subsequently to a huge inflow of low-skilled immigrants. Thus, most firms, especially the small and middle-sized ones, adopted technologies which where complementary with low-skilled labour. The outcome was a huge housing bubble. The subsequent destruction of more than 35% of unskilled jobs in the Spanish construction industry as a result of the bursting of the bubble – together with very low interregional labour mobility induced by an underdeveloped rental market and job insecurity – has been a source of much greater mismatch in Spain than in France, via the slow reallocation process of workers from this rapid declining industry to other sectors. High mismatch is evident in the huge outward shift during in the Spanish Beveridge curve during the Great Recession (see Figure 2): there are now many more unemployed workers for each job vacancy. What if Spain had French legislation? To quantify the impact of EPL on unemployment we find empirical counterparts for the parameters of the above-mentioned model to match a set of labour market variables in both countries – the unemployment rate, the share of temporary jobs, and the destruction rate of permanent jobs – both during the expansionary period (2005-2007) and during the Great Recession (2008-2009). The impact of the crisis is captured through an adverse aggregate productivity shock and greater mismatch. In line with the preceding discussion, we find that, while a negative aggregate shock (of about 10% in productivity) suffices to match French target variables during the slump, a reduction of about 40% in matching efficiency, on top of a similar aggregate shock to that in France, is required to match Spanish target variables in this period. Once the model performs well in both periods, we run counterfactual simulations to address the issue of what would have been the increase in Spanish unemployment during the Great Recession had Spain adopted French EPL right before the slump started. Imputing the French-economy levels of the EPL gap to the Spanish economy yields a robust result: the unemployment rate would have increased by about 45% less than the observed rise, had Spain adopted the lower French EPL gap before the crisis (i.e., a rise of 4.1 percentage points in the unemployment rate rather than the 7.5 percentage point increase observed between 2005-07 and 2008-2009). Finally, the dynamics indicate that, in the short run (during the first six months or so) the reduction in the unemployment rise would be lower (about 2 percentage points less) than in the longer run (after one and half year or so), since a reduction in the EPL gap exacerbates job destruction at the beginning of the recession by making lay-offs less expensive. However, this short-run effect is later offset by a much larger job creation, so that the differential in the unemployment increase achieves the above-mentioned 3.4 percentage points. Recently there have been several policy initiatives in Europe defending the idea of eliminating the EPL gap through the introduction of a single labour contract (see Bentolila et al. 2010). All these proposals highlight the negative effects induced by the permanent-temporary contract divide. As a result, they all advocate the elimination of most temporary contracts and the introduction of a single labour contract with severance pay that is increasing with seniority in the job. We interpret our results as providing some support for these proposals. Bentolila, S, T Boeri, and P Cahuc (2010), “Ending the Scourge of Dual Labour Markets in Europe”, VoxEU.org, 12 July. Bentolila, S, P Cahuc, J Dolado, and T Le Barbanchon (2010), “Two-Tier Labor Markets in the Great Recession: France vs. Spain”, CEPR DP 8152. Bentolila, S and JF Jimeno (2006), “Spanish Unemployment: The End of the Wild Ride?”, in M Werding (ed. ), Structural Unemployment in Western Europe: Reasons and Remedies, MIT Press. Blanchard, OJ et al. 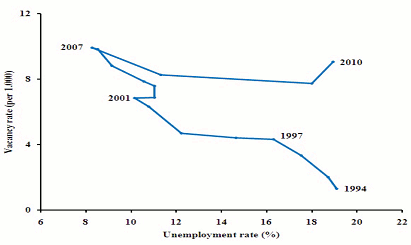 (1995), “Spanish Unemployment: Is There a Solution?”, CEPR Report. Blanchard, OJ and A Landier (2002), “The Perverse Effects of Partial Labor Market Reform: Fixed Duration Contracts in France”, Economic Journal 112: 214-244. Cahuc, P and F Postel-Vinay (2002), “Temporary Jobs, Employment Protection and Labor Market Performance”, Labor Economics, 9:63-91. Mortensen, DT and CA Pissarides (1994), “Job Creation and Job Destruction in the Theory of Unemployment”, Review of Economic Studies, 61:397-415. Saint-Paul, G (1997), “Is Labour Rigidity Harming Europe's Competitiveness? The Effect of Job Protection on the Pattern of Trade and Welfare”, European Economic Review, 41:499-506. 1 It is a search and matching model with endogenous job destruction à la Mortensen-Pissarides (1994) which extends the models of Blanchard and Landier (2002) and Cahuc and Postel-Vinay (2002).